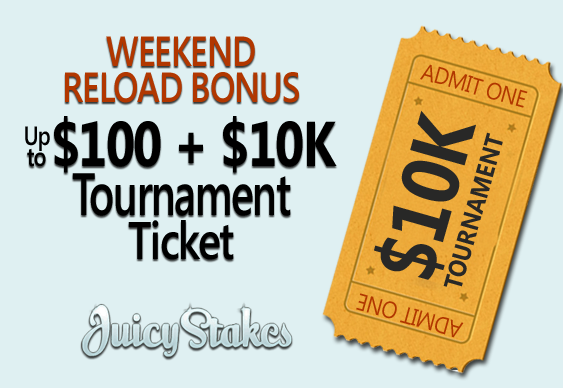 There's more than just bonus cash on offer for players reloading at Juicy Stakes Poker this week. As well as a 100% bonus worth up to $100 players can look forward to a ticket into a special tournament where a $10,000 prize pool will be won. To take advantage of the cash and tournament offer, use the coupon code RELOAD06. Be quick though as the code is only valid until 7 June. The $10K Satellite Special tournaments are held every Saturday at 2:00 PM EST (7pm London time). The bonus and tournament tickets aren't the only goodies on offer from Juicy Stakes this month. The site has also added to to roster of freerolls, starting with a $250 giveaway this Thursday. Qualifiers for the forthcoming Caribbean Poker Tour event in Punta Cana are ongoing too. A once in a lifetime package worth $4,000 will be awarded with feeder satellites starting from just $2.20.